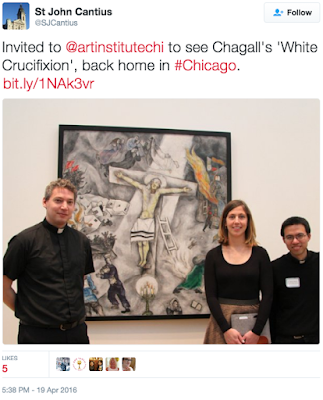 Some of the priests at Saint John Cantius were invited to The Art Institute of Chicago for a viewing of Marc Chagall’s blasphemous painting, the “White Crucifixion”. 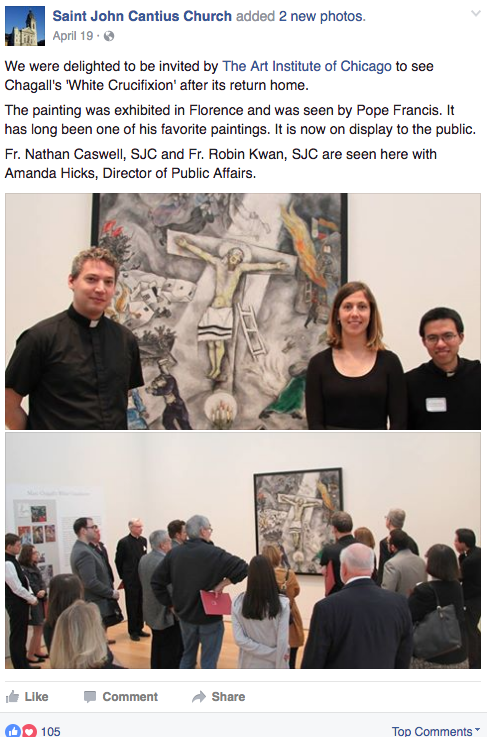 They were so delighted to see Francis’ favorite painting that they posted photos of themselves viewing it on St. John Cantius’ social media accounts at facebook and at twitter. Surprised? 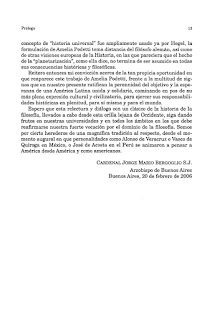 We at Call Me Jorge... are not for Saint John Cantius church in Chicago and its associated programs are all about the “smells and bells” in the post-Summorum Pontificum 1962 Indult and the Novus Ordo Missae offered there daily as their official website explains. 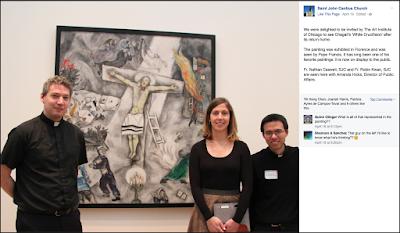 We call it Tridentine Judaism as they bestow upon Talmudic Judasim (this time with the Hasidism of Chagall’s blasphemous painting) an undeserved honor as being the eternal victims instead of being the transgressors that they are. 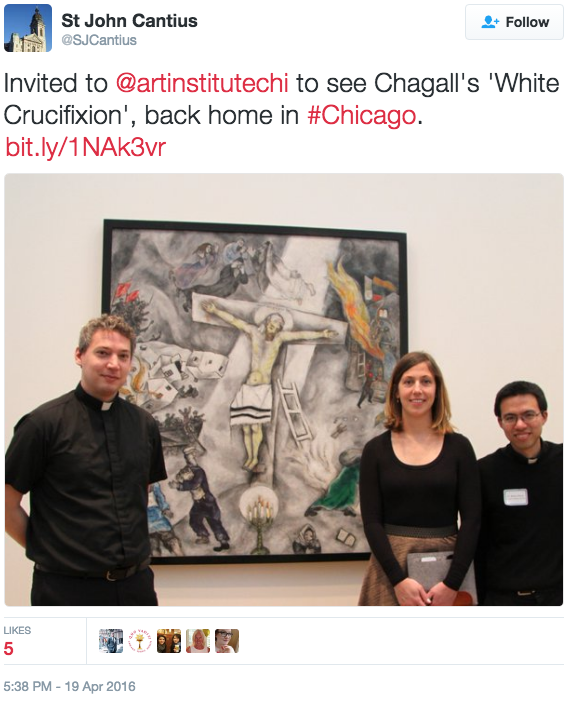 Why would a Catholic pose with, much less promote blasphemy such as the “White Crucifixion”? 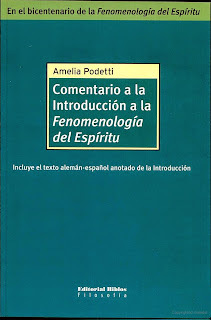 Ignorance of Talmudic Judaism? Ignorance of the Catholic Faith? Or simply, love of “smells and bells”? 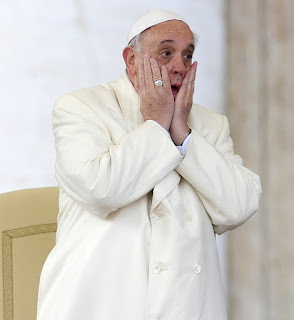 Some blame it on terrorism, others that Christmas day fell on a Sunday but we at Call Me Jorge... believe it is Francis fatigue. Since the reign of Francis has begun he has managed to alienate most of the Vatican bureaucracy and to burn out several reporters. 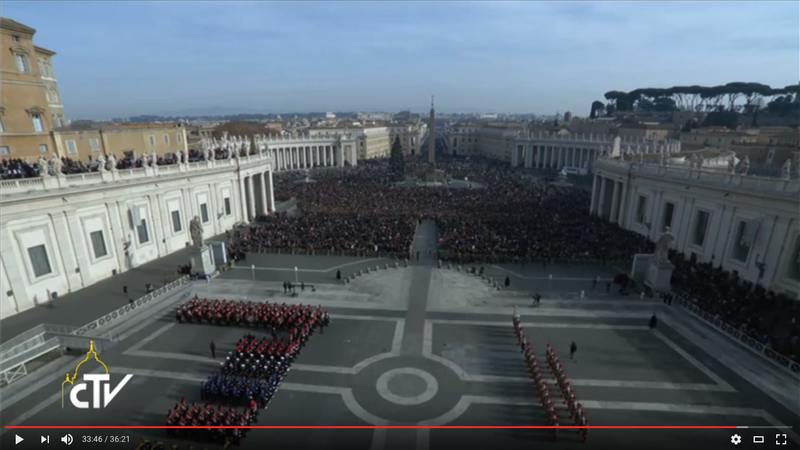 The crowds have never really shown up for Francis as they did for Benedict XVI. 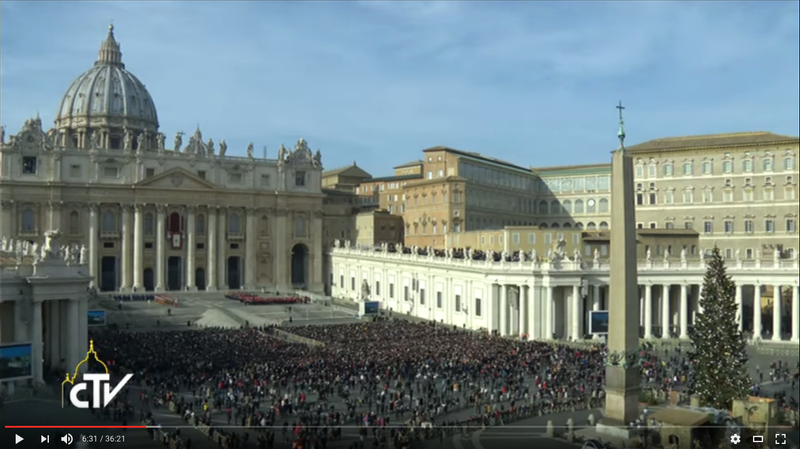 His ‘Urbi et Obi’ had seen a marked decline until this year when attendance was flat even though the Jubilee Year of Mercy had just recently finished. 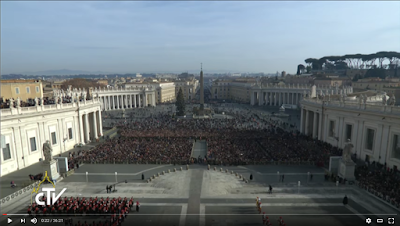 According to Vatican reporter, Rocco Palmo, “Thanks to Jubilee, attendance at 2016 Pope events in Rome was 3.95mil – up from 3.2m in 2015, but still marked decline from 5.9m in 2014.” Could it be that people think the man is irrelevant? Looking at the social media and mainstream media that’s been crafted by Opus (ju)Dei’s Greg Burke it’s little wonder why he is thought of in this manner. The crowd looks a bit sparse. People are still trickling in. Still a lot of empty space. 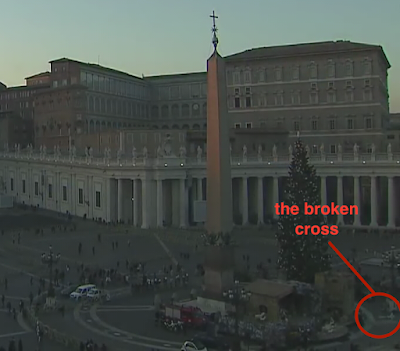 As full as St. Peter’s Square gets these days. 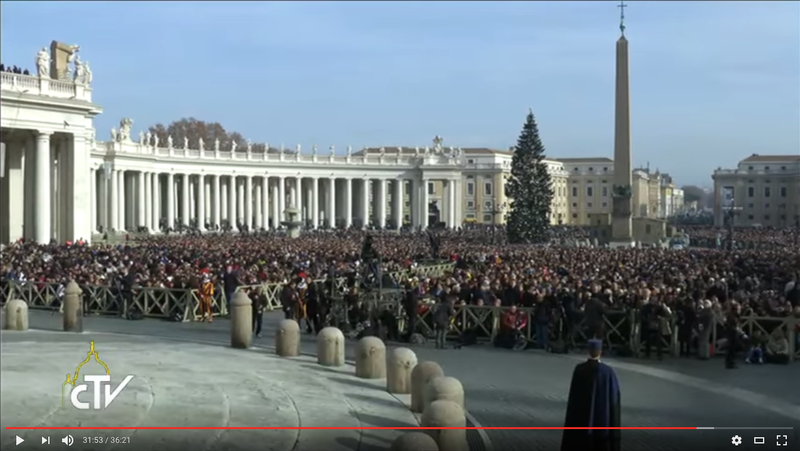 About as many in attendance as last year’s Urbi et Orbi. 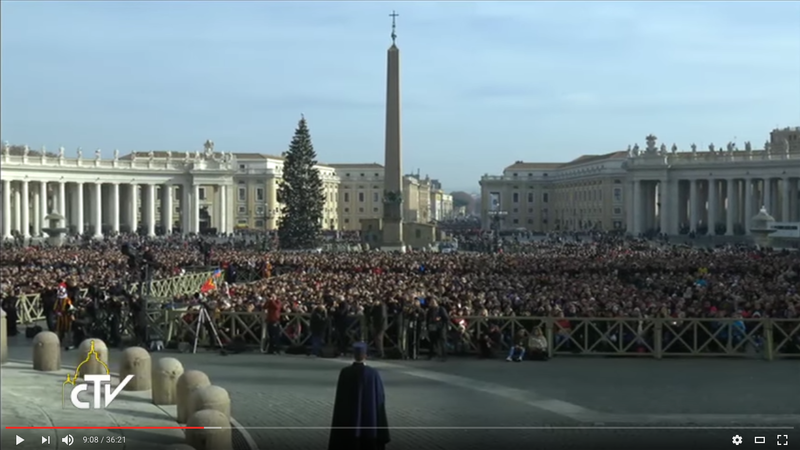 Labels: attendance, Christmas Message and Urbi et Orbi Blessing, Greg Burke, St. Peter's Square, Urbi et Orbi, where's the people? Francis the ‘humble’? Nope, more like Francis the ‘liberal’! 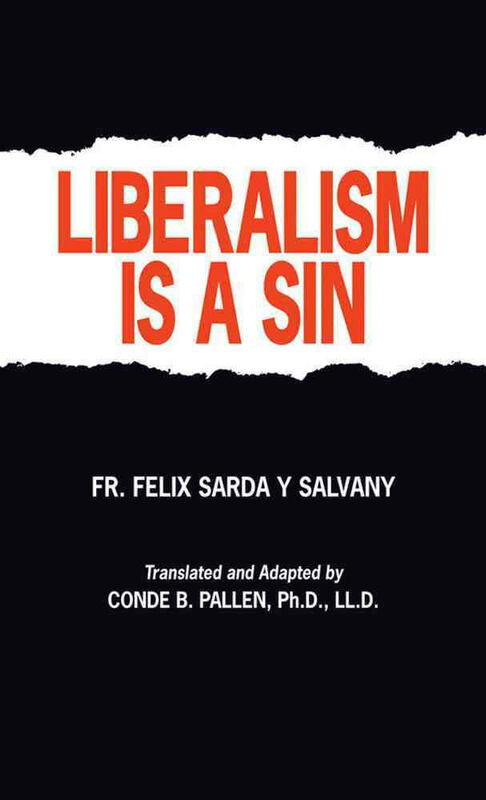 After demonstrating that the humility of Francis is false, the author concludes with one question, ‘Can one be both a liberal and a Catholic?’ Click the links below and read to find out. ...the Basilica of Our Lady of Aparecida!!! Social Justice Warriors unite: misery, hunger, injustice, drugs, racism, and unemployment! Is Jesus getting a blood transfusion or giving one? A Francis look-alike brings in the Bible! The oldie everyone loves — the roller skating circus-like atmosphere! Plenty of nonsense but none of it solemn! Listen to the United States Under-Secretary of the Treasury for Terrorism and Financial Intelligence, Adam J. Szubin, invoke Chabad’s Rabbi Menachem Mendel Schneerson’s message of Hanukkah and don’t miss the shout out to President Ronald Reagan for naming it the “National Menorah”. 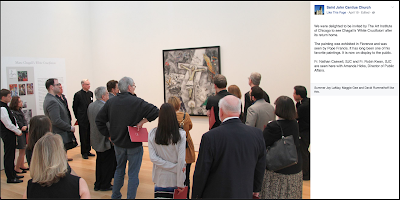 Ever wonder what the miracle of Hanukkah, the ‘light’ of the eight days of oil, represents? 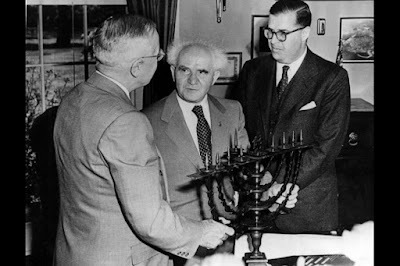 Additionally, in the opinion of one scholarly skeptic, Hanukkah’s sub rosa significance, communicated esoterically through the image of the menorah, is as a testimony to “the supreme position which the Holy Judaic People occupy in God’s eyes. …The secret of Hanukkah was disclosed by Rabbi Levi Isaac ben Meir of Berdichev (known as ‘the Kedushat Levi’ after his eponymous treatise), an important eighteenth century halachic [legal] authority, who revealed the fact that lighting the Hanukkah menorah does not commemorate the victory of the Biblical Maccabees. The Chanukah 'miracle of the oil' has its origin in Talmud tractate Shabat 21b and is generally accepted as originating 600 years after the events recorded in Book of Maccabees. Numerous rabbinic scholars have determined that the fable was invented at a time when militant Judaism would be a liability (c.f. the Bar Kochba rebellion), and so the 'miracle of the oil' was contrived and emphasized over the militant theme in the Book of Maccabees to mollify fanatics and thereby avoid backlash. 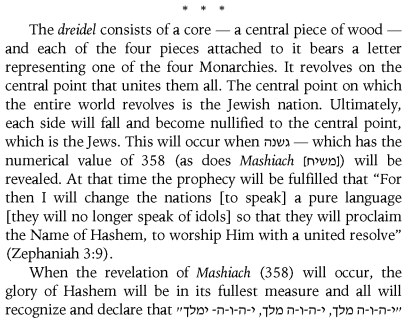 This is an example of Judaic dispensationalism at work. For our time, when fear of backlash is less, we can see that the militant theme of Chanukah is more heavily emphasized (c.f. 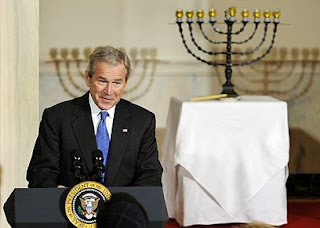 George W. Bush's White House Chanukah party speeches, Chabad Chanukah literature). 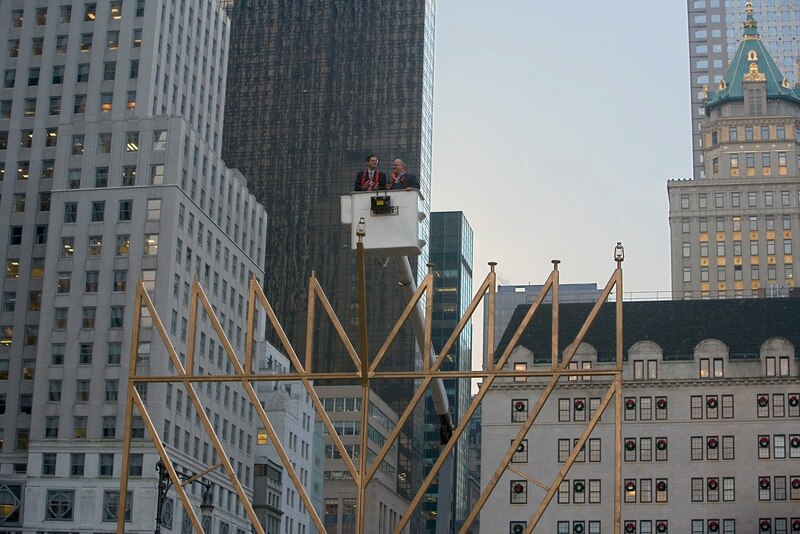 Why is Dreidel-Man at the menorah lighting? David Ben-Gurion, Israeli Prime Minister, and Abba Eban, Israeli Ambassador to the United States, presented Harry S. Truman with a menorah in the White House on May 8th, 1951. 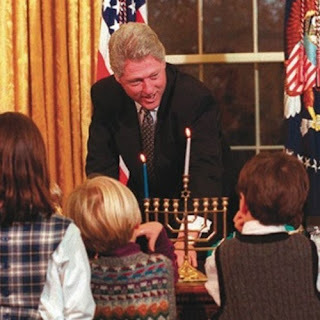 It was the first menorah in the White House. 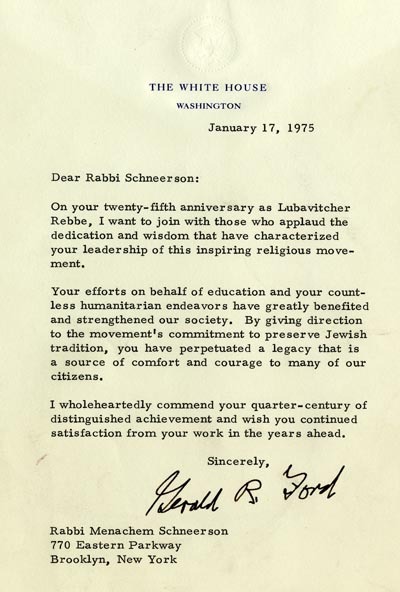 Gerald Ford's 1975 letter to Rabbi Menachem Mendel Schneerson. 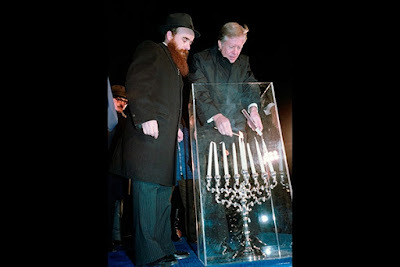 The Chabad-Lubavitch sect of Hasidism, of which Schneerson was the head of, is responsible for the public display of the ‘National Menorah’ on federal government grounds. Navy operations Spc. 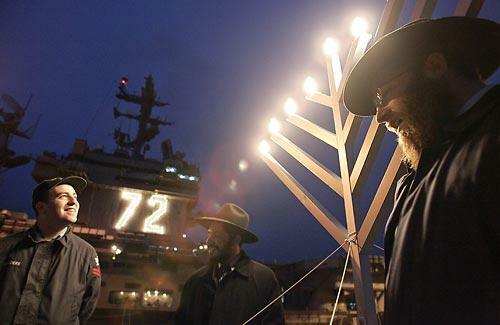 Eric Sanders, left, watches Rabbis Elazar Bogomilsky, right, and Eli Estrin give a blessing after lighting an electric menorah aboard the USS Ford on Thursday at Naval Station Everett on the fifth night of Hanukkah. Sanders was instrumental in getting the menorah on board ship, December 30, 2005. Jimmy Carter lighting the National Menorah at Lafayette Park with Rabbi Abraham Shemtov, December 17, 1979. 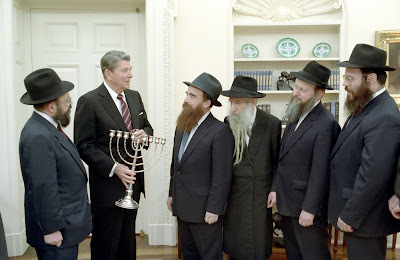 President Reagan Meeting with the Friends of Lubavitch, Abraham Shemtov, Moshe Herson, Shlomo Cunin, Samuel Raichik, Moshe Feller, Israel Shmotkin, Yoseph Groner, Sholom Wineberg, Abraham Korf, and Zelig Rivkin, December 15, 1987. 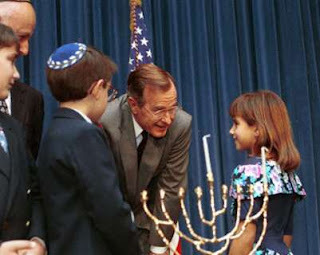 President George H. W. Bush speaking with children at 1991 White House Staff Hanukkah Menorah lighting. 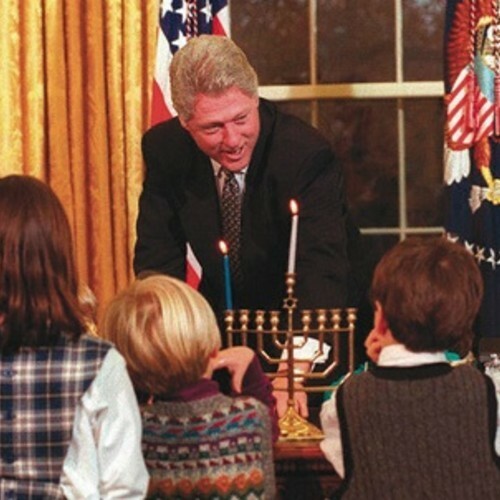 Bill Clinton became the first president to actually light the menorah in 1993 with a dozen schoolchildren in the Oval Office. 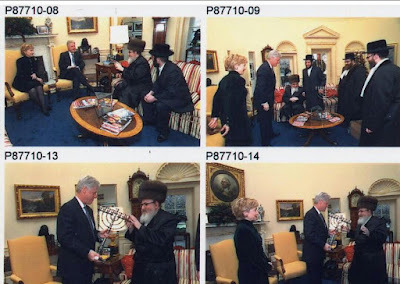 Rabbi David Twersky with President and First Lady Bill and Hillary Clinton in the White House on December 22, 2000. George W. Bush lights the menorah in 2001, the same year he inaugurated the White House Hanukkah Party. 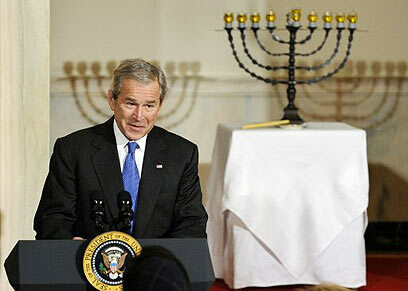 George W. Bush later lit this Hanukkah menorah in White House on December 15, 2008. Barack Hussein Obama at the White House Hanukkah Ceremony in 2010. Barack Hussein Obama's words at the White House Hanukkah Ceremony on December 2, 2010. 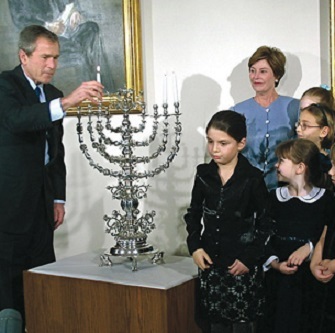 Barack Hussein Obama with the ‘displaced persons’ menorah in 2011 celebrating Hanukkah. Barack Hussein Obama words at the White House Hanukkah Ceremony on December 8, 2011. Ten days early, Barack Hussein Obama cites the Prophecy of Isaias (Isaiah) from the Old Testament as stating that the Jewish people are the messiah or “a light unto the nations” as first done by Shlomo Yitzchaki (aka Rashi), jokes that the mainstream media is Jewish, and invokes a ‘tall tale’ from the Hasidic High Priest of Holocaustianity, Elie Wissel, as well as says that Wiesel corrected him many times, and endorses Talmudists as the eternal victims on December 16, 2016. Ten days early, Barack Hussein Obama has his second menorah lighting and cites a fable as truth “George Washington and the menorah of Valley Forge” and says that Hanukkah inspired America’s founders two centuries ago to revolt from the British Crown, and Barack give a shout out to the deceased terrorist Shimon Peres and his family in attendance. One shudders to think of the garbage spouted off by Zuppi during his homily. The screenshots are from this video. and singing around a menorah on a table! 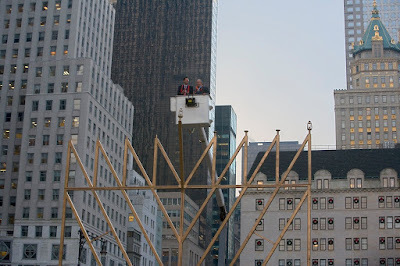 and had the world’s largest public menorah display in his diocese at 59th Street and Fifth Avenue created by Yaacov Agam and paid for by the Chabad-Lubavitchers! 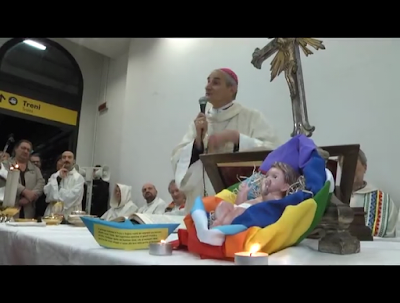 The title of the video below reads: the President's visit during Christmas to a church of the Franciscan Catholic community in Ramla, Israel. The text description reads: Children dressed in their finery and in Santa Claus costumes, "sang the traditional songs in English and Arabic along with the President, Mayor Mary Church. The president of Israel on 22 December 2013 at the time this video was made was none other than the late Shimon Peres. Besides being a terrorist mastermind, Peres was a personal friend of Francis. 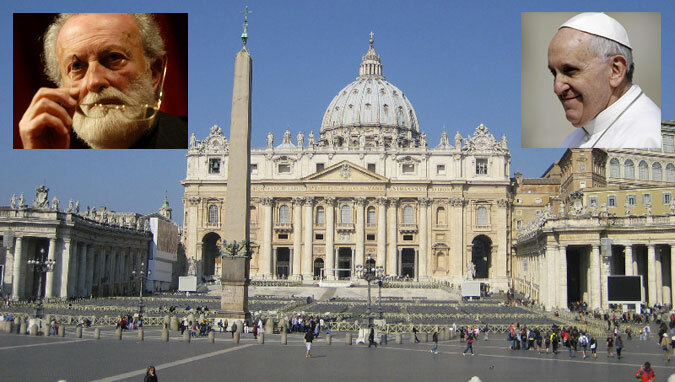 In fact, Shimon thought so highly of Francis that he proposed that Francis lead a new organization — a United Nations for religions. 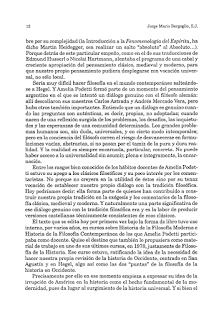 Peres was also the impetus for Francis visit to Israel where he escorted Francis to the grave, of the Zionist Theodor Herzel, and where Francis placed a wreath of flowers. 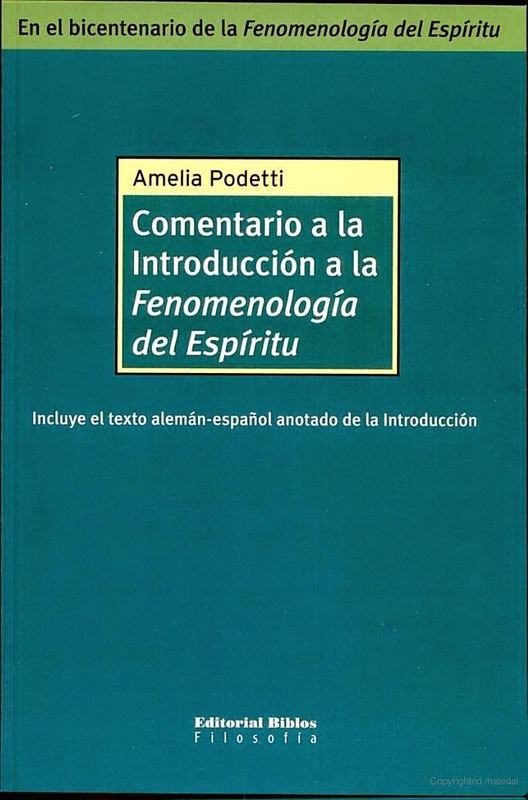 One could speculate that this friendship between the two began because they pray to the same god, especially after knowing that Peres endorsed Francis’ book, Rome and Jerusalem: Rabbi Talks with Pope, which names Jesus the Christ in the Hebrew as “Yeshu” (the rabbinical acronym for “May his name and his memory be wiped out”) as well as refers to priest with “komer” (the Hebrew for “idol worshipers”). 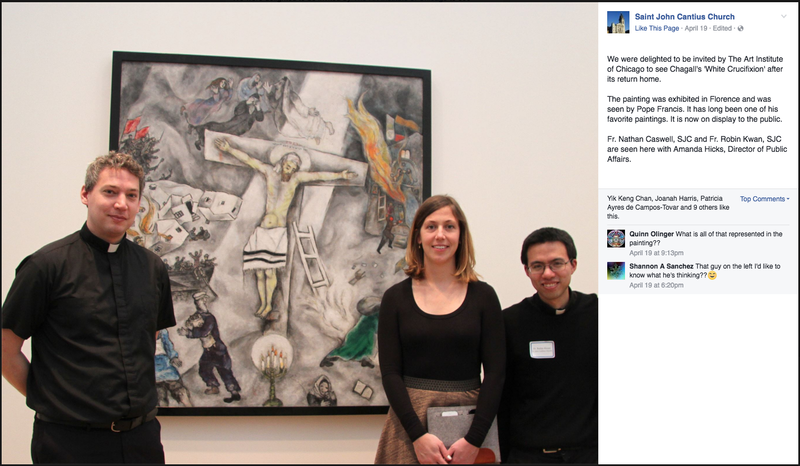 Remember, Francis’ favorite painting also contains this blasphemy against Our Lord. Now we return to the video. What are the ‘traditional songs’ are sung in the video? Happy Xmas (War Is Over) by John Lennon and Jingle Bells by James Lord Pierpont. Yes, a song written by an atheist in 1971 and another by a unitarian in 1857 qualifies as ‘traditional’ in the Noahide Novus Ordo. Neither author believes in the Catholic Faith instituted by Christ nor do they mention the Christ-child in their lyrics. What a celebration of Noahidism! account is dead but can be watched below. 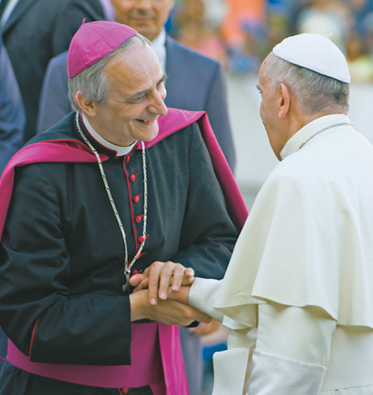 Remember when Thomas ‘three Martinis a day’ Rosica interviewed Bp. Bernard Fellay? 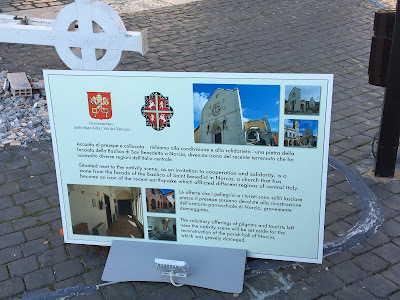 Thomas ‘three Martinis a day’ Rosica is a fan of Martin Luther & his 95 Theses! 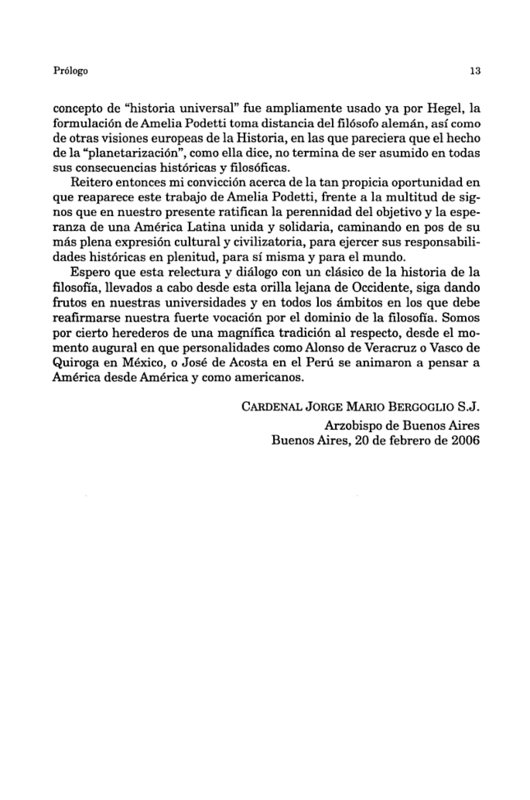 According the website of the Archdiocese of Buenos Aires, Bergoglio gave the homily on these Christmas Eves: 2001, 2003, 2004, 2005, 2006, 2010, and 2011. 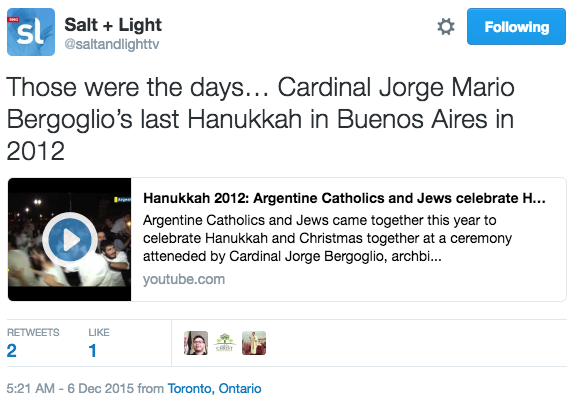 One wonders if the great Rabbi Bergoglio also participated in the kabbalistic ‘Nittel Nacht’ traditions which take place on both Christmas Eves; tearing toilet paper, referring to Christmas by derogatory names, avoiding Talmud study, reading the Toledot Yeshu, playing cards, playing chess, sewing (the favorite of the late Lubavitcher Rebbe, Rabbi Menachem Mendel Schneerson), paying bills, balancing the books, or spinning the dreidel. Who will Francis have over at the Vatican this year as his guests and will they celebrate the Talmudic hoax, Hanukkah, which glorifies the supremacy of Klal Yisroel (the Judaic people) over the rest of humanity? As always the underlines are ours for emphasis. 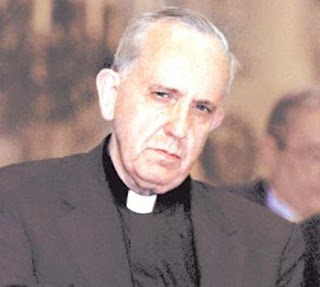 THESSALONIKI, Greece – Cardinal Jorge Mario Bergoglio of Argentina made history last week by becoming the first pope from Latin America and the first from the Jesuit order. 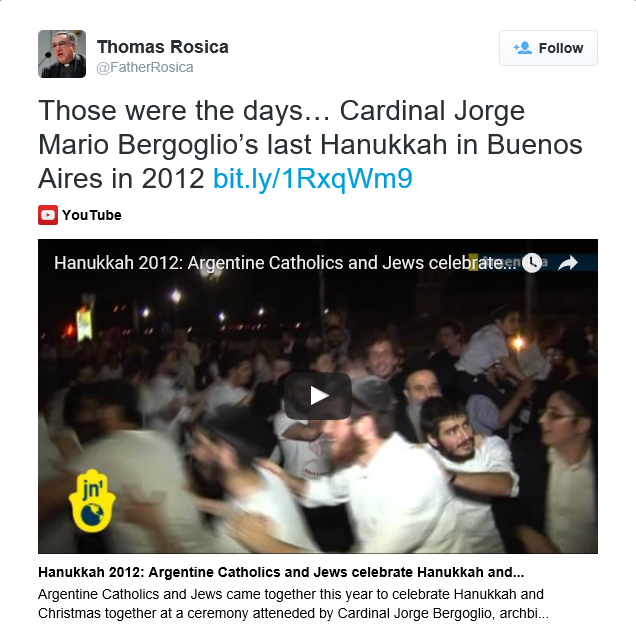 This week, Argentine Jewish leaders, attending a World Jewish Congress meeting in Greece, predicted a new era for Catholic-Jewish relations and described a man who is very close to the Jewish community, who regularly visits synagogues and has invited Jewish friends to Christmas dinner. “I think it is the first time a pope has been elected that the Jewish community knows previously, and has a long history [with],” said Claudio Epelman, director of the Latin American Jewish Congress, speaking to The Times of Israel on the sidelines of the weekend meeting, held in the northern port city of Thessaloniki in conjunction with public events memorializing the near-destruction of the ancient Sephardic community during the Nazi occupation of northern Greece during World War II. 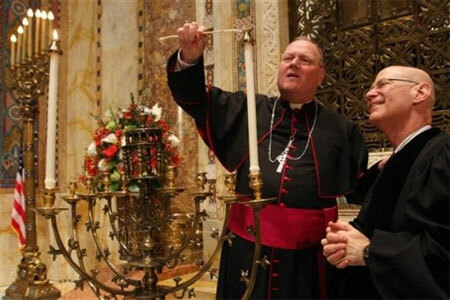 Epelman said Sunday he was “very, very optimistic” about Catholic-Jewish relations under the new pope, who took the name Francis I and has embarked on what has already been described as a humble, hands-on papacy, eschewing the pope-mobile in favor of shaking hands and meeting children on his first Sunday in office amid the vast crowds at the Vatican. “If you had to choose a pope by Jewish interest, you would have had to choose Bergoglio,” Epelman said. 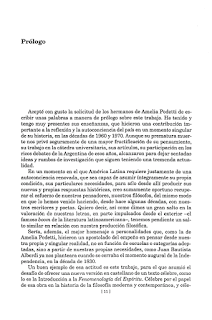 “He is a real friend of the Jewish community,” he continued, describing Francis as “totally committed to interfaith activities.” He “loaned out” the Buenos Aires cathedral to the Jewish community to hold a memorial event honoring the victims of Kristallnacht and the Holocaust, Epelman recalled. Schlosser described how for “many years,” Cardinal Bergoglio has come to his synagogue for selichot (the series of evening penitent prayers held before Rosh Hashana), where he would also give a formal talk. 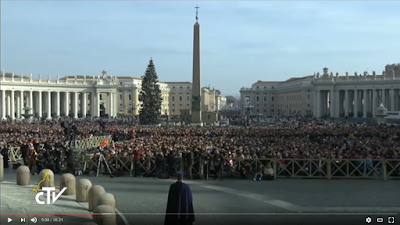 Schlosser, who has also had Christmas dinner with the pope, confirmed that Francis I often prefers public transportation to his official car. 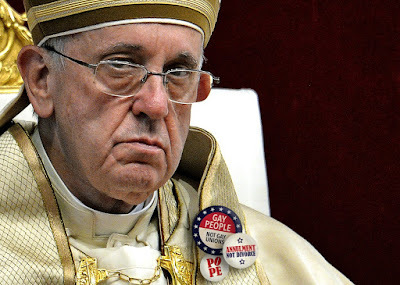 After a visit to the AMIA Jewish community office building (which was bombed 19 years ago by alleged Iranian and Iranian-backed operatives, with the loss of 85 lives), Bergoglio eschewed his official vehicle in favor of the subway, he said. Schlosser may have an opportunity to discuss these and other issues with his friend the pope in person: He and Epelman left Greece Monday to arrive in Rome as the pope’s personal guests for his Tuesday inaugural mass. 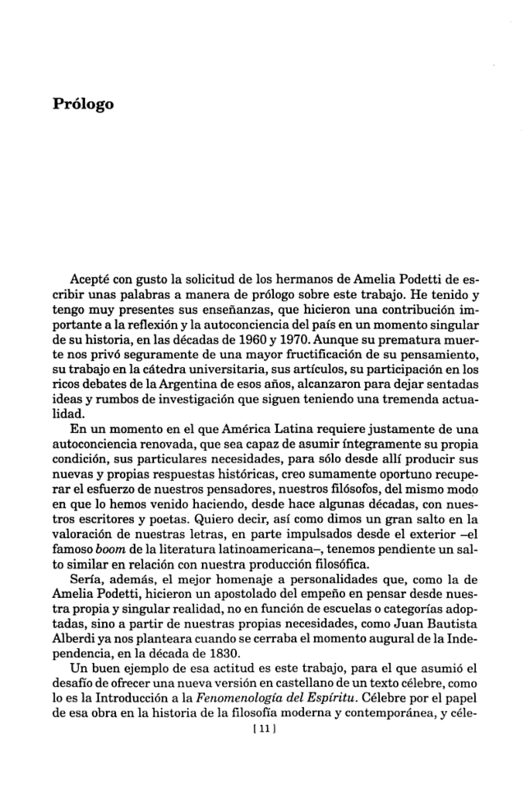 "We believe we can make a contribution to the world, us 45 traveling Argentineans," said Epelman who spent seven Christmases with then Cardinal Bergoglio at Mass and afterwards at dinner. 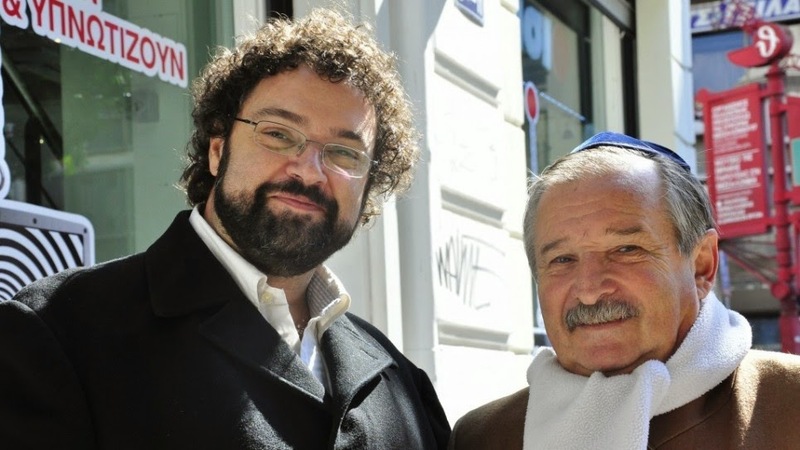 Previously, he was the only Jewish observer of General meeting of Latin American and Caribbean Bishops in Aparecida in Brazil where the agent was Bergoglio and thereafter met the present Pope." you can’t make this stuff up file! The Franciscan friars of Lahore celebrated the birthday of the Prophet Muhammad along with some Muslim families. The interfaith celebration was held yesterday at the "Dar ul Naeem", center of Franciscan formation, during which the two religious communities also exchanged Christmas wishes. Fr. Jamil Albert, coordinator of the Justice Peace and Integrity with Creation (JPIC), told AsiaNews: ""This is the first time we invited everybody for the joint Eid and Christmas feast. The clerics are more than our friends, many showed up despite differences within Islamic sects as to whether the day should be observed or not. The example of Eid celebration in Christian's house will inspire the whole country". The ceremony began with the recitation of excerpts from the sacred books of both religions. Some Islamic clerics offered evening prayer in the chapel of the Franciscan center. Then Christmas carols and the naats (songs of praise to Muhammad) were sung and later Christians and Muslims shared dinner. The festivities ended with the cutting of a cake, gifted by the Muslims. failed to liquify was that the human volcano known as Francis is getting ready to blow and we will see the wrath of “a man sick with power”. 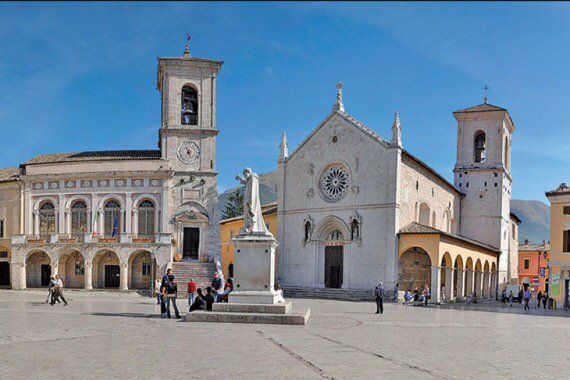 St. Francis of Assisi before he died warned of a “Destroyer” who will cause “great Schisms” in a prophecy. Much of what he prophesied (see below) rings true to Francis. Could it be? We hope not, instead may God help Francis discover and learn to love the Faith. source: Works of the Seraphic Father St. Francis Of Assisi, pp. 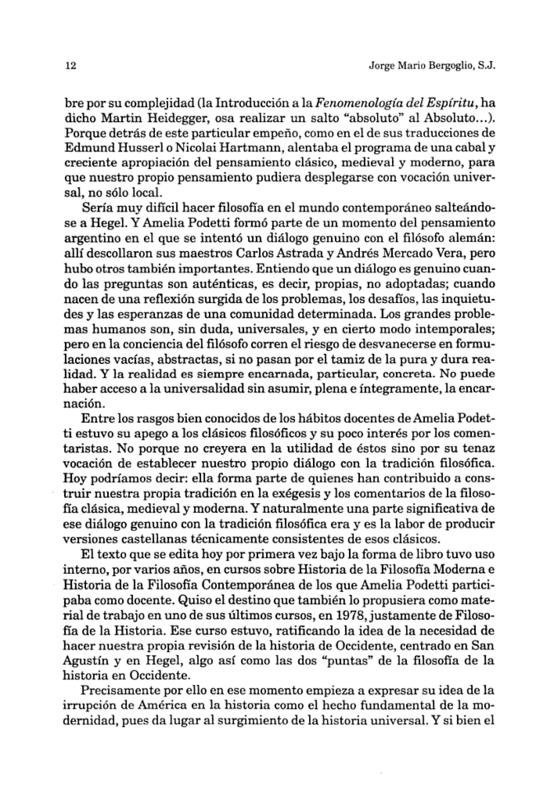 248-250. 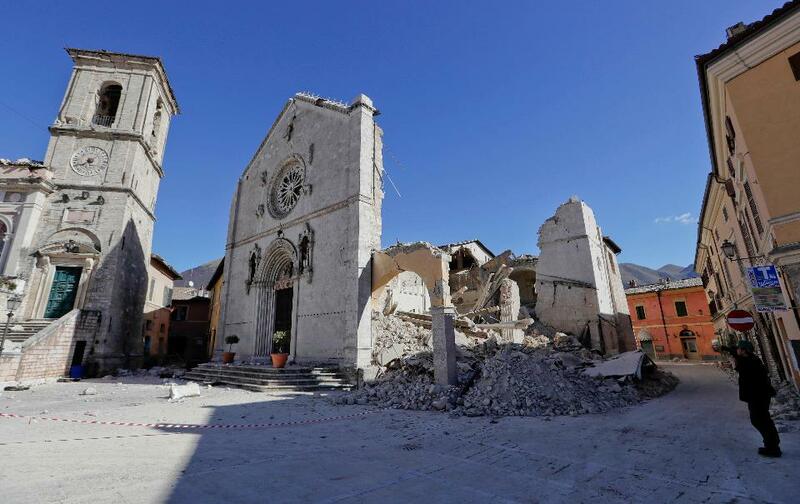 The purpose of it, ostensibly, is to raise money to help rebuild the church in the town of Norcia which was struck by an earthquake on 30 October 2016. 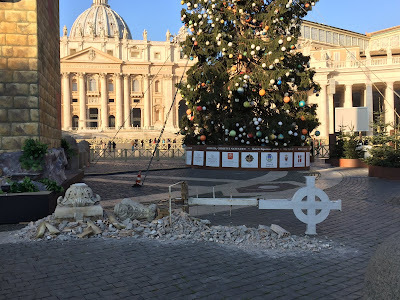 The broken Cross is a from the destroyed Basilica of St. Benedict. 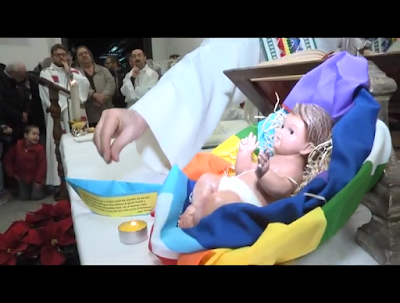 The Nativity also paid tribute to the plight of the Moslem invaders of Europe with a boat. Don’t worry Francis still found room in the manger for the Holy Family. Isn’t it a bid odd that a nativity scene, the purpose of which is to honor Our Lord’s birth, is instead focusing on Francis’ pet causes once again? 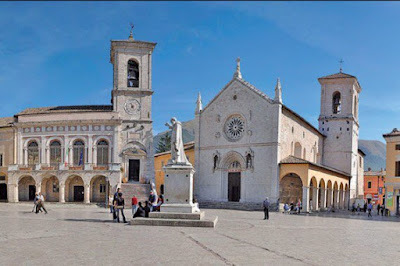 The Basilica of St. Benedict in its better days. The Basilica of St. Benedict post earthquake. Christmas is about welcoming the Moslem invaders into Europe! 29:47 37:19, 54:46, 55:14 in the video. Lutheran theses coincide with what happened in the first centuries: At the end of his article, Scalfari writes, "In the early centuries of Christianity, the sacraments were celebrated directly by the faithful and the priests only served.” Scalfari continues, “Francis agrees on these Lutheran theses that coincide with what happened in the first centuries." The Vatican did not deny Scalfari’s claims. 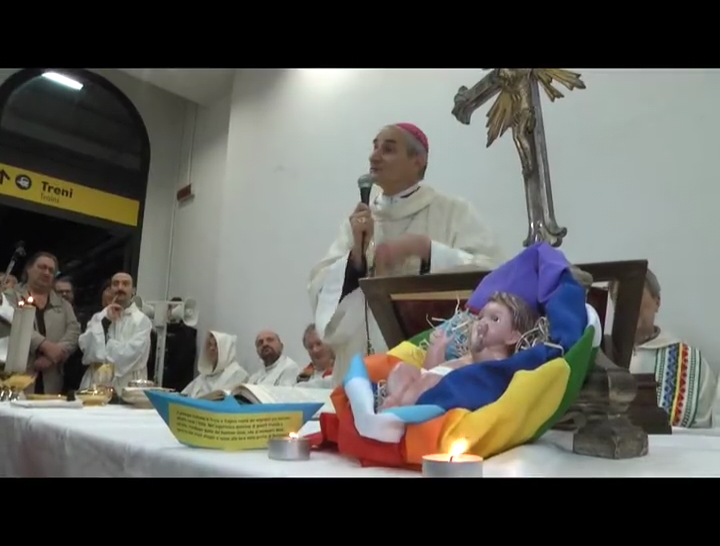 source: La Repubblica, Scalfari: "Gli 80 anni del mio Papa rivoluzionario"